LoDo Chair Massage has been providing chair massage & corporate yoga to offices, conventions, special events and various occasions since 2008. We have made mobile chair massage our specialty! We keep our processes simple- because your time is valuable. From our speedy communications and estimates, to our no-nonsense scheduling system, we focus on getting chair massages & corporate yoga to you and your team as easily as possible. Our team of reliable massage therapists are thoroughly vetted to ensure they will take great care of your needs. We have a large staff in over 21 metro areas nationwide, so we can accommodate any size chair massage event. Plus, our rates and services are the best! 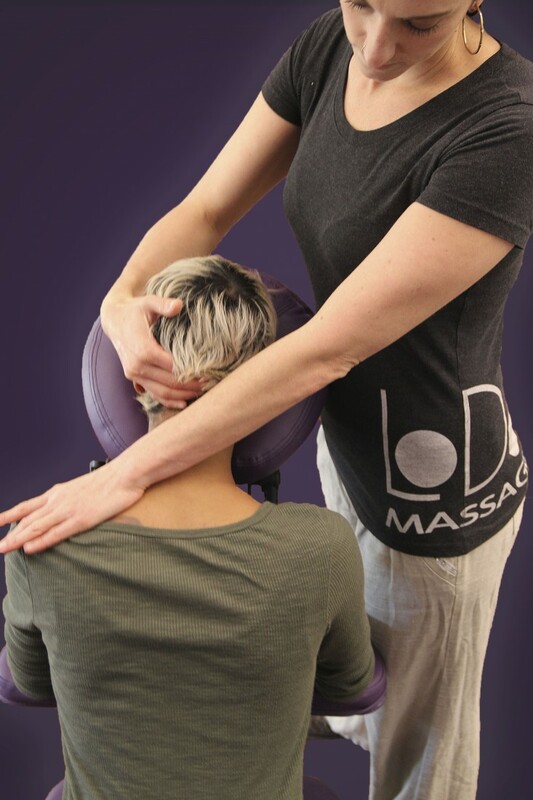 When you book chair massage with LoDo, you can expect a day filled with smiling faces and relaxation. Once the details of the event have all been worked out, one or more of our rock star therapists will be assigned. On the day of the event, your assigned therapist(s) will arrive at least 15 minutes early to set up their adjustable, mobile chair which can accommodate most heights and sizes. Once set up, the therapist(s) will be ready to start, providing anywhere from 5-30 minute massages. Chair massage tends to focus on the neck, shoulders, and back- however, your therapist can also focus on specified areas of concern. All while fully clothed, the stress and physical tension from sitting at a desk all day will quickly melt away. Our therapists always sanitize their chair after each session and will use a fresh face cover each time. Booking a Yoga or Chair Yoga event? Your employees and/or guests will be treated to a one hour class for Yoga, or a 45 minute class for Chair Yoga. Both styles are suitable for all fitness levels. Our Yoga instructors will provide music, however the event organizer is typically responsible for providing mats. No props needed! In Chair Yoga, our instructor will lead the class through a variety of seated and standing poses, which can all be done in a chair or at a desk. Chair Yoga focuses on the areas that are impacted by sitting all day. Music provided. 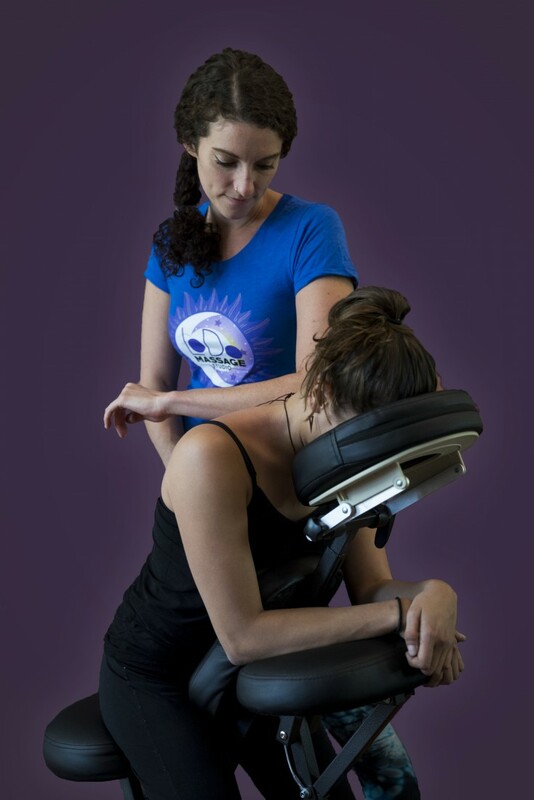 LoDo has been bringing chair massage to corporate offices and events in Denver, Colorado for over 9 years. We know the business of relaxation inside and out! Our therapists are the best in town and they love what they do. Since our success in Denver, we have continued to expand across the nation to 21 other major cities- including Seattle, Portland & San Diego. We are continuing to grow this year by tackling the East Coast, starting with Atlanta, Georgia. Our vision is to further inspire the development of corporate wellness programs, and to promote the importance of employee health in the workplace. 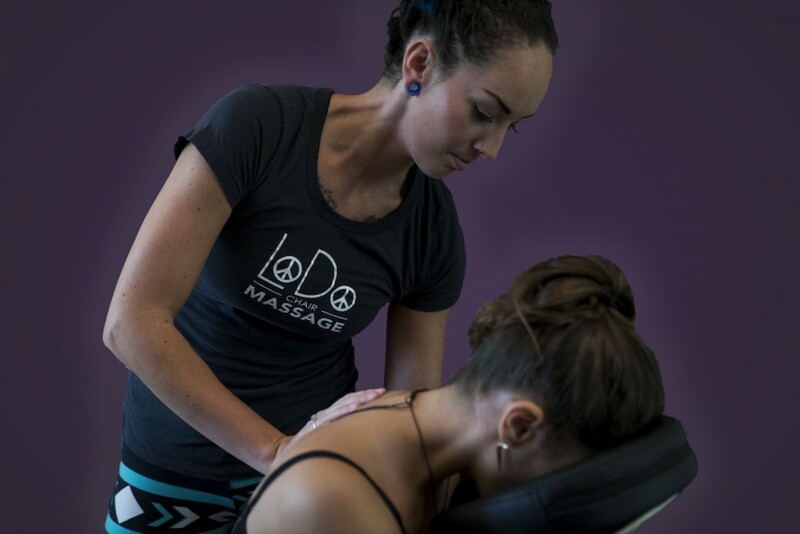 All in all, LoDo strives to provide the most relaxing and effective experience for your event while maximizing the benefits of on-site chair massage and yoga. Chair Massage: We require a 5x5 space for each therapist. No power, extra tables, or chairs needed. Mat Yoga: A large enough space is needed to accommodate all participants. If there are over 25 attendees, a PA system is required. Chair Yoga: Chairs are needed with enough space for each person to stretch their arms out. If there are over 25 attendees, a PA system is required.